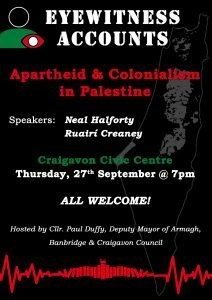 An eyewitness report on apartheid and colonialism in Palestine from Neal Halforty and Ruairí Creaney. Thursday 27th September, 7pm in Craigavon Civic Centre, 66 Lakeview Road, Craigavon. All welcome. Hosted by Deputy Mayor Paul Duffy of Armagh, Banbridge and Craigavon Council.